Who Will Win the 2018 Presidential Election? Some Zimbabweans and political observers say it is likely that President Emmerson Mnangagwa will win the forthcoming presidential election, to be held between July and August this year, as the country’s opposition is in disarray though they doubt that the southern African nation will hold a free, fair and credible election. The Zimbabweans, who were panelists at an event Thursday organized by the Global Press Institute hosted by the Newseum in Washington DC focusing on political issues in Zimbabwe, said they are convinced that Mnangagwa will romp to victory in the forthcoming presidential election. One of the panelists Linda Mujuru of Global Press Journal says the opposition is too weak to challenge Mnangagwa. She adds that Nelson Chamisa, who is currently locked in a battle with vice president Thokozani Khupe over the leadership of the MDC-T, once led by the late Morgan Tsvangirai, may lose the presidential poll even if he is attracting a large number of people at his election rallies. Her views were echoed by Wadzanai Mhute, a multimedia producer, author and reporter with the New York Times, who says the disjointed opposition is giving Mnangagwa a win on a silver platter. The MDC-T led by Chamisa recently filed an urgent court application to stop Khupe from using the party name and logo, which was dismissed with costs by High Court judge Justice Francis Bere. Another court case is pending in which Khupe is challenging her withdrawal from parliament by the Chamisa group, which claims that she is no longer a member of the opposition party. 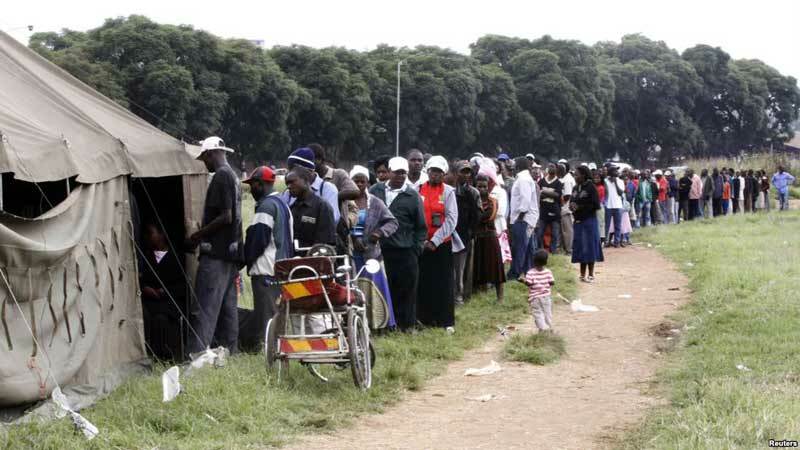 Charles Mutuma, executive director of the United States-based Zimbabwe Diaspora for Democracy, says apart from this, it is likely that the opposition will be disadvantaged by lack of electoral reforms and related issues. Irene Petras of the International Center for Not-for-Profit Law says the opposition should unite if it wants to defeat Zanu PF in the forthcoming general elections. Some nations like Britain are already attempting to strengthen relations with Zimbabwe following a fallout with former ruler Robert Mugabe, who was removed from power last year by Mnangagwa aided by the Zimbabwe Defence Forces in what the former president has described as a military coup. Award-winning British journalist Paul Kenyon, host of the BBC Panorama program, says Mnangagwa is expected to win the election, which is expected to be almost free and fair. He says Britain will always relate well with nations creating democratic space for its citizens. The British and then President Mugabe’s government clashed in 2000 when the ruling party grabbed white-owned commercial farms under its land reform program widely condemned for causing a near-collapse of the agricultural sector.